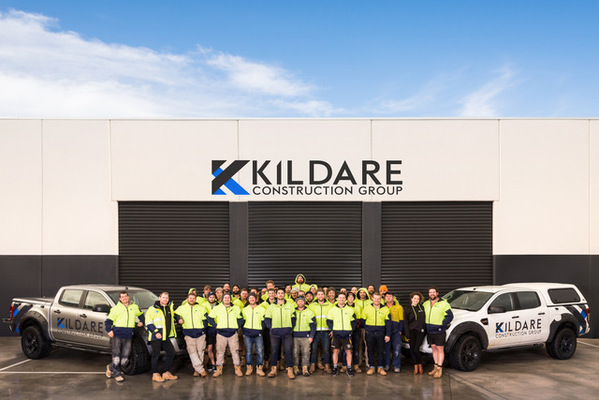 The growing Kildare Construction Group team outside their Geelong headquarters. Kildare Construction Group was a finalist in the Advanced Manufacturing & Industry and Medium to Large Business categories at the 2018 Geelong Business Excellence Awards. The Geelong-based carpentry company prides itself on creating jobs for local people while producing outstanding results for multiple clients. Established in September 2015, Kildare has grown from a two-person team of director Bede Tuohy and Penny Tuohy in accounts to a multi-leveled workforce of 51 tradespeople and office staff. “Both profit and turnover has increased at a steady rate to ensure our growth is sustainable,” writes the company in its awards entry. Kildare specialises in medium-sized commercial projects. “We pride ourselves on building projects at a consistently high standard and we operate with integrity, honesty and transparency both with our clients and employees,” the company says. Bede Tuohy has vast knowledge of carpentry and management, working his way up from an apprenticeship to manage national and international companies working on project such as offshore detention centres and a Brisbane hospital. He was also a member of the first-40 squad for the Manly Sea Eagles, which he believes has contributed to his team-building and leadership abilities.